Osela’s Multi-Dots and Multi-Line pattern are based on a combination of Diffractive (DOE) and refractive optics. 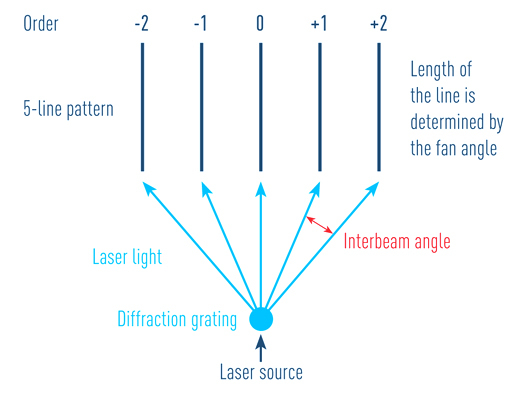 The DOE efficiently splits the beam with a precise angular spacing while maintaining the properties (dimension, divergence, and polarization) of the input laser. The DOEs are high quality diffraction gratings etched directly into fused silica providing stability over time and temperature as required in the most demanding industrial applications. for dots, use the letter D after the desired number of beams and for Lines use the letter of L followed by the desired interbeam angle. i.e. 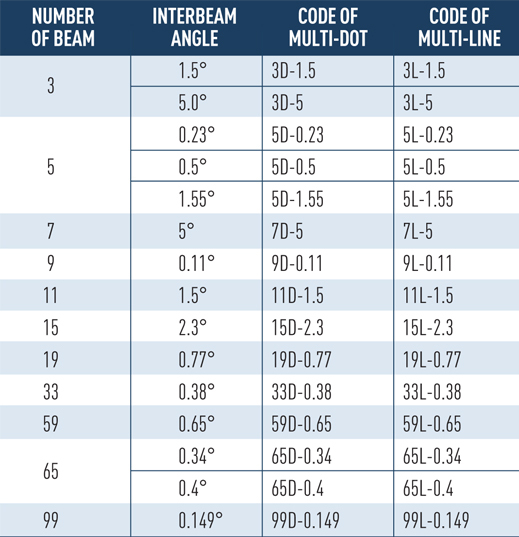 : for 65 lines with 0.34° interbeam angle, the code is …….-65L-0.34. Then add this suffix to SL or CL laser series part number ex: SL-660-50-S-A-20-65L0.34, where 20 stands for the fan angle, the 65L stands for 65 Lines and the 0.34 for 0.34° Interbeam angle.